Charles Gutierrez comes from Southern California, growing up within the club performance music scenes, starting at the young age of fourteen, playing in the local L.A. and Orange County venues. 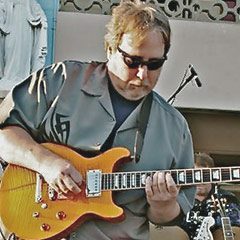 Primarily a guitarist, but playing a variety of instruments, Gutierrez studied at Musicians Institute in the early 80’s with private guitar instruction from a variety of influential teachers and mentors including Joe Pass and Tommy Tedesco. During the mid 1980’s, Gutierrez ventured into the production elements of music, moving from the performance live room and into the studio production control room, starting as intern, then second and primary engineer. During the early 90’s he used these skills within the urban L.A. Hip Hop scene as engineer and co-producer, supporting young urban artists and exploring the emerging digital technology uses in the music industry. During the mid 1990’s Gutierrez moved toward an educational instructor career path teaching in local and emerging community college programs in commercial music, with many years dedicated to Long Beach City College and Cerritos Community College programs instructing courses of commercial guitar and bass, songwriting, music performance, music theory, audio theory, production recording at all levels, computer DAW, music technology, and more. In 2006 Gutierrez spent time training and updating his instructional skills at USC with faculty gaining Expert Certifications in Pro Tools for Music Production and Post Production. In 2008 he joined the USC Music Industry Faculty as an Adjunct Instructor in program curriculum and has continued to be part of the faculty since. Now, a Full-Time Faculty member as Senior Lecturer of Music Technology in the Audio Production program, Gutierrez instructs courses in Music Technology, Computer DAW, Critical Listening and Fundamentals of Audio Recording. Gutierrez’ passion for music and education are translated to presenting course curriculums that focus on foundational elements of music production and technology, with a special attention in presenting content and skills that are pertinent, useful and timeless to the student and their music industry production process.